Google is getting in the thermostat game. The company announced on Monday that it purchased Nest, the maker of high-tech thermostats and smoke detectors, for $3.2 billion in cash. 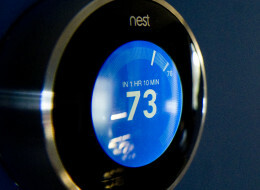 Founded by former Apple engineers Tony Fadell and Matt Rogers in 2010, Nest grabbed headlines for its pricey line of Internet-connected thermostats and fire alarms — products not usually known for being sleekly designed or particularly high-tech. Nest sells its thermostats on the promise of saving homeowners energy by learning their daily habits and adjusting temperature accordingly. And it set out to make smoke detectors radically easier to use: A wave of the hand stops it from beeping. “Nest’s founders, Tony Fadell and Matt Rogers, have built a tremendous team that we are excited to welcome into the Google family,” Google CEO Larry Page said in the company’s own press release. Nest will retain its brand name within Google. But the purchase keeps the hyped thermostat maker away from other potential suitors — most notably Apple where Fadell helped conceive and design the first iPod in 2001. He left the company seven years later to found Nest, and many have since wondered when Apple would scoop it up. According to a report last month in The Information, Google was developing a high-tech thermostat of its own last year, implying that it was going to get into the home-automation business with or without Fadell.